122 I WRAPS I 2015 | r e s o u r c e s | Product Name 3M Graphic Solutions - St. Paul, MN - www.3m.com 3M Scotchcal Graphic Film with Comply v3 Adhesive IJ170Cv3 Cast • 2 Luster 1 • • 60" 200 yd Vehicle, Watercraft, Sign, Label, Smooth Wall 3M Wrap Film Series 1080 Cast 3.5 Gloss 34 • • 60" 50 yd Vehicle 3M Wrap Film Series 1080 Cast 3.5 Matte 20 • • 60" 50 yd Vehicle 3M Wrap Film Series 1080 Cast 3.5 Satin 10 • • 60" 50 yd Vehicle 3M Wrap Film Series 1080 Cast 3.5-5 Brushed Metal 6 • • 60" 50 yd Vehicle 3M Wrap Film Series 1080 Cast 3.5-5 Carbon Fiber 3 • • 60" 50 yd Vehicle 3M Wrap Film Series 1080 Cast 3.5-5 Straight Fiber 2 • • 60" 50 yd Vehicle 3M Controltac Graphic Film IJ160-10 Cal • 4 Matte 1 • 60" 200 yd Fleet, Transit, Label, Sign, Smooth Wall 3M Controltac Graphic Film IJ162-10 Cal • 4 Matte 1 • 60" 200 yd Floor, Sign 3M Controltac Graphic Film IJ162-114 Cal • 4 Matte 1 • 54" 50 yd Floor, Sign 3M Controltac Graphic Film with Comply Adhesive IJ160C-10 Cal • 4 Matte 1 • • 60" 200 yd Fleet, Transit, Label, Sign, Smooth Wall 3M Controltac Removable Graphic Film with Comply Adhe- sive 3545C Cal • 4 Matte 1 • • 54" 100 yd Fleet, Transit, Label, Sign, Smooth Wall 3M Scotchcal Changeable Graphic Film IJ3555 Cal • 4 Matte 1 • 60" 200 yd Fleet, Transit, Sign, Smooth Wall 3M Scotchcal Graphic Film with Comply Adhesive Series IJ35C Cal • 3.2 Matte, Gloss 1 • 60.5" 200 yd Label, Sign, Smooth Wall 3M Scotchcal Graphic Film IJ10 Cal • 3.1 Matte, Gloss, Clear 2 54" 50 yd Label, Sign, Smooth Wall 3M Scotchcal Graphic Film IJ35-10 Cal • 3.2 Gloss 1 60.5" 200 yd Label, Sign, Smooth Wall 3M Scotchcal Graphic Film IJ35-20 Cal • 3.2 Matte 1 60.5" 200 yd Label, Sign, Smooth Wall 3M Scotchcal High Tack Graphic Film IJ39-20 Cal • 3.5 Matte 1 54" 50 yd Fleet, Vehicle, Label, Sign 3M Controltac Print Film 40C-10R Cal • 3 Gloss 1 • • 60" 200 yd Fleet, Vehicle, Sign, Smooth Wall, Floor 3M Controltac Print Film 40C-20R Cal • 3 Matte 1 • • 60" 200 yd Fleet, Vehicle, Sign, Smooth Wall, Floor 3M Transit Ad Graphic Film IJ36-20 Cal • 3.4 Matte 1 60.5" 200 yd Fleet, Vehicle, Transit, Sign 3M Transit Wrap Graphic Film IJ46-20 Cal • 4 Matte 1 60" 200 yd Fleet, Vehicle, Transit, Smooth Wall 3M Scotchlite Reflective Graphic Film IJ5000 N/A • 6 Luster 1 48" 50 yd Fleet, Label, Sign 3M Scotchlite Reflective Graphic Film IJ5100 N/A • 7 Luster 1 48" 50 yd Fleet, Transit, Label, Sign Cast/Calendared/Extruded Printable? Thickness (Mil) Finish (Matte/Gloss/Chrome, etc.) Number of Colors Available Air Egress Technology Repositionable? Max. 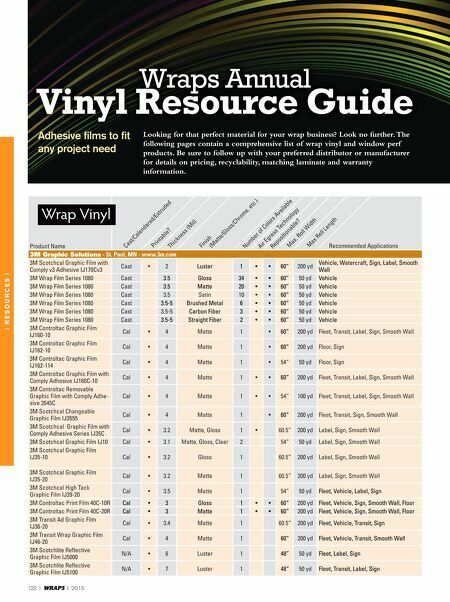 Roll Width Max Roll Length Recommended Applications Wrap Vinyl Wraps Annual Vinyl Resource Guide Adhesive films to fit any project need Looking for that perfect material for your wrap business? Look no further. The following pages contain a comprehensive list of wrap vinyl and window perf products. 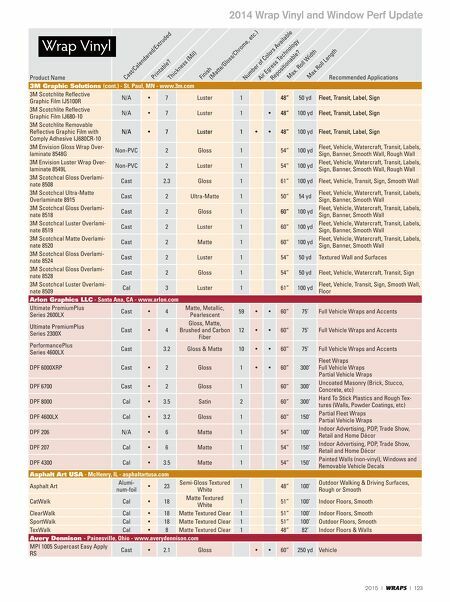 Be sure to follow up with your preferred distributor or manufacturer for details on pricing, recyclability, matching laminate and warranty information.